At the end of a beautiful and sunny day in Bristol … a beautiful sunset, as seen from the Royal Fort Gardens on campus! Terry McMaster (Director, BCFN) and Charl (in his role as member of the management committee of the BCFN) attended a PhD Recruitment Workshop in Beijing, China (23-24th of November). Although very short, it was a very successful trip, with lots of contact with excellent (prospective) students! Beijing was cold, but gloriously sunny! It was a real pleasure to visit Beijing again! In the final stop before starting to head back to Bristol, Merv, Peng and Charl are attending the 6th Annual Symposium on Nanobiotechnology held at ICeMS (Institute for Integrated Cell-Material Sciences), Kyoto University. 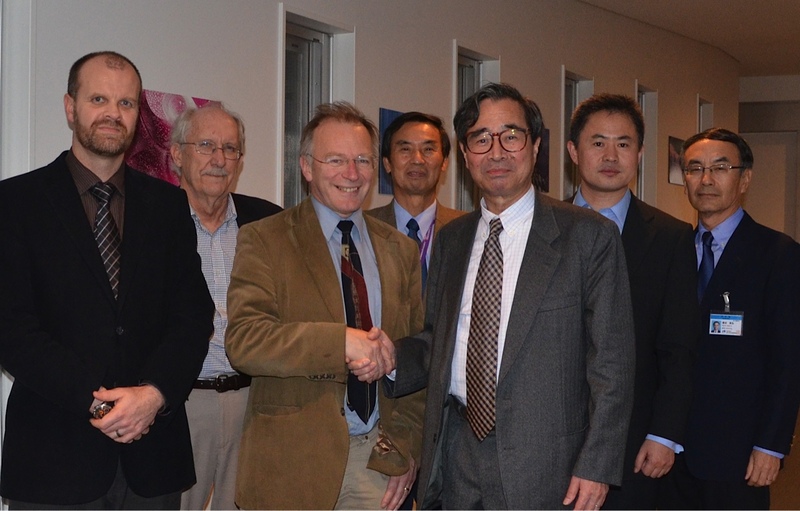 They have enjoyed the generous hospitality of Prof Kitagawa, Deputy Director of ICeMS, and visited the very impressive laboratories of Prof Tanaka. Prof Aono, director-general of MANA, organised an excellent half-day symposium, with speakers from the NSQI and MANA. After such a good start we look forward to active exchange of researchers between Bristol and Tsukuba! Visit and symposium at NIMS, Tsukuba. We arrived at NIMS in Tsukuba today, after taking the famous Shinkansen from Kyoto. The Executive Vice-President of NIMS, Dr. Sone, and Prof Aono, Director General of the International Centre for Materials Nanoarchitectonics, MANA, at NIMS, Tsukuba, Japan, were our hosts today. Prof Aono has also organised a joint NSQI-MANA Symposium for Wednesday, 7th of November. Charl, Merv, Peng and David arrived in Kyoto over the weekend before heading off to the National Institute for Materials Science (NIMS) in Tsukuba. On Sunday they had a chance to walk around some of Koyoto’s exquisite temples and very interesting shopping areas, and enjoy some fantastic Japanese food! Certainly worth another visit to this historical city! Posted on November 4, 2012 by Angel S.
Día de Muertos or Day of the Dead is one of the biggest and most spectacular celebrations in Mexico. During the two first days of November millions of Mexican families adorn streets and houses with colourful ofrendas or offerings. The main idea behind an ofrenda is remembering and honouring the memory of your ancestors. Favourite foods or objects of the deceased relatives and colourful decorations -made of paper and cempoaxochitl flower- are the main components that comprise an ofrenda. The visual elements used in ofrendas have had a huge impact in Mexican artistic expression, such as paintings, literature and photography. This influence has gone beyond Mexico motivating a group of people in Bristol to create an exhibition. 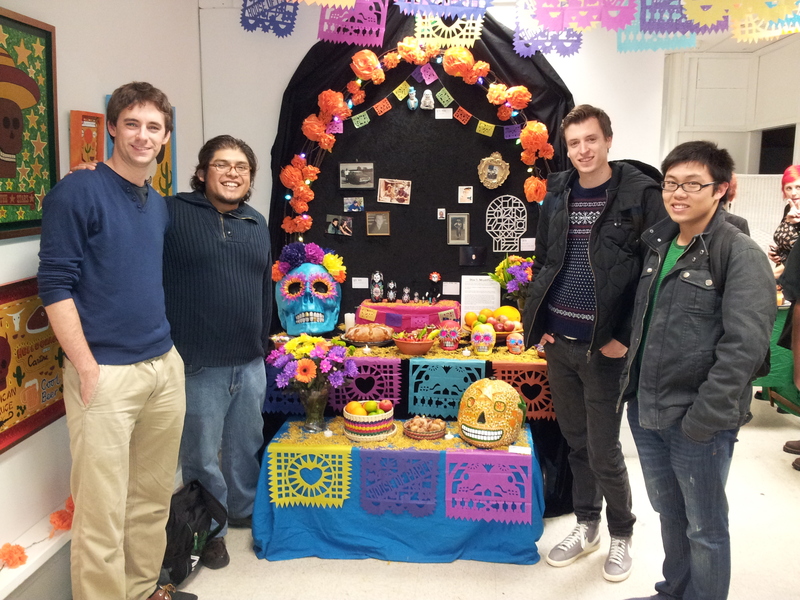 Some members of the group had the chance to see this exhibition guided by Angel, a Ph.D. student in our group.